Hieronymus Bosch (c 1450–1516), Calvary with Donor (c 1490-1500), oil on oak panel, 74.8 x 61 cm, Koninklijke Musea voor Schone Kunsten van Belgiê, Brussels. Wikimedia Commons. A fairly standard devotional painting of Christ crucified, set in a sparse landscape. The story of the crucifixion of Jesus Christ is well-known and told in the gospels of the New Testament, albeit with variations between the four different accounts. Jesus Christ is shown on the cross, prior to his death. At the foot of the cross are four figures. Christ is shown wearing a white loin cloth, with the crown of thorns in place, his head hanging and eyes closed. Other than the nails penetrating each hand and his feet, there are no other significant marks visible on his body. At the left, wearing a mourning cloak, is the Virgin Mary, her hands pressed against one another in prayer. To the right of her is Saint John, whose hands are held in front of him, and who appears to be talking to Mary. On the right side of the cross are the donor, kneeling with his hands held in prayer, and the Apostle Peter, who holds the keys to heaven in his right hand. None of the figures is looking at Christ. The cross stands alone on gently undulating grassy ground, and neither of the other two crosses is visible. In the foreground, on the grass, are some scattered human bones. The landscape behind is typical of the area south of ‘s-Hertogenbosch, with small woods and open grassland, and the small city in the far distance. A few people are seen making their way away from the viewer, towards the city. There is a windmill on a small hillock in front of the city wall. At the far right edge is a hollowed-out tree trunk which looks a little odd, and has a cruciform appearance. The basic view shown here is simple and extremely popular, showing only Christ on his cross, a small group at its foot, but with a plain and quite empty landscape around. 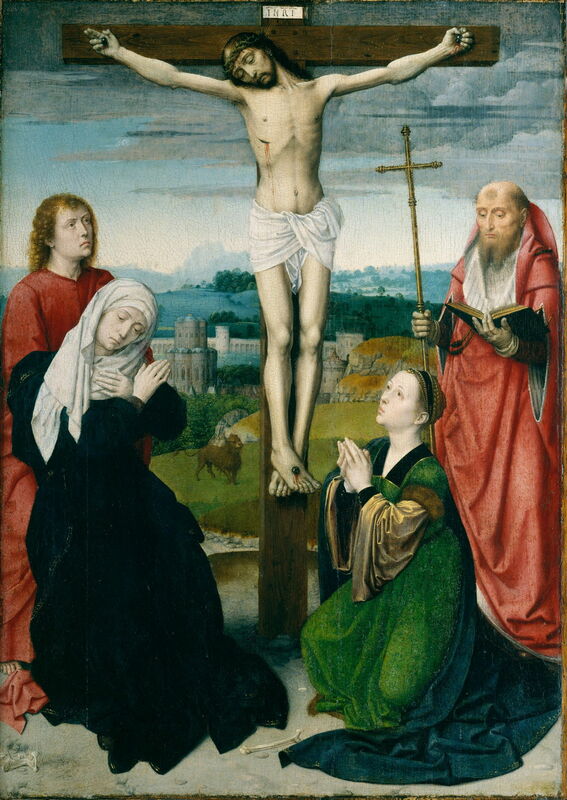 Gerard David (c 1455–1523), The Crucifixion (c 1495), oil on wood, 52.5 x 37.5 cm, The Metropolitan Museum of Art (Rogers Fund, 1909), New York, NY. Courtesy of The Metropolitan Museum of Art. 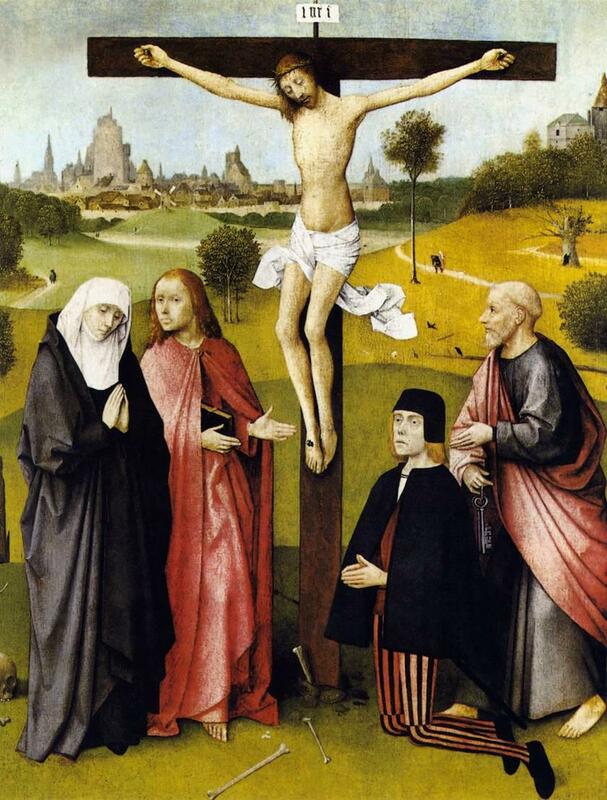 It is very similar to that of Gerard David’s The Crucifixion (c 1495), which was painted at about the same time. The Apostle Peter is shown with the keys to the gate of heaven, making him easy to identify. He is presenting the donor, who is kneeling and turned slightly towards the viewer. This implies that the donor’s saint was Peter, making his first name almost certainly Peter or one of its variants. Peter presents the donor to Saint John, who stands with Mary on the higher ranking side of Christ. John is recognised by his youthful appearance, and the book which he holds in his right hand. This is the unified John the Evangelist, as Apostle, author of the Gospel, and of the Book of Revelation (discussed previously). Saint John in turn makes the case for the donor’s salvation to the Virgin Mary. Although hard to tell from this image, she is wearing her signature dark blue robes under a grey mourning cloak, and prays to Christ on behalf of the donor while grieving for Christ. The greatest contrast between Bosch’s painting and David’s is not in the figures and foreground, but the background. Bosch’s localises very clearly to ‘s-Hertogenbosch, but is a desolately empty landscape, as if it too were in mourning for Christ. This aids the donor’s contemplation and quiet devotion. This painting has not apparently been the subject of any dispute as to it being an authentic work by Bosch’s hand. At some later stage, the donor was overpainted with a figure of Mary Magdalene, which was removed during conservation work undertaken in 1966-7. Matthijs Ilsink, Jos Koldeweij et al. (2016) pp 268-277 in Hieronymus Bosch, Painter and Draughtsman: Catalogue Raisonné, Yale UP and Mercatorfonds. ISBN 978 0 300 22014 8. Posted in General, Painting and tagged Bosch, David, painting. Bookmark the permalink.